Chelsea striker Diego Costa has been charged with violent conduct by the Football Association after his side's 2-0 win over Arsenal on Saturday. Costa, 26, put his hands in the face of Arsenal centre-back Laurent Koscielny prior to clashing with Gunners defender Gabriel, who was sent off. The FA has also charged Gabriel, 24, with improper conduct and both clubs with failing to control their players. Arsenal are to appeal against Gabriel's dismissal and three-match ban. 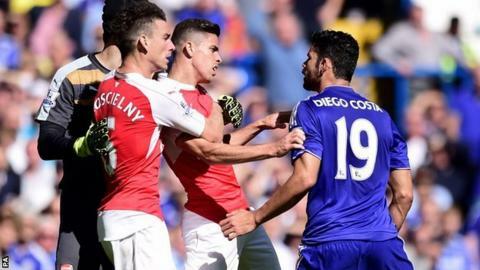 Costa has until 18:00 BST on Tuesday, 22 September to respond to the charge, which is for the clash with Koscielny. Having confirmed the match officials did not see the incident, the FA supplied video footage to a panel of three former elite referees. They each had to independently rule Costa's actions to be an instant red card for the FA to proceed with the charge. If Costa accepts the charge he will serve an automatic three-match suspension with immediate effect but, if he contests it, an independent regulatory commission will rule. Chelsea face Walsall, Newcastle and Southampton in their next three domestic fixtures. Referee Mike Dean booked both Costa and Gabriel for their spat, before the latter was dismissed for kicking out at the Blues forward. Gabriel and both clubs have until 18:00 BST on Thursday, 24 September to reply to their charges. Arsenal midfielder Santi Cazorla, who was sent off for two bookable offences, has been warned about his behaviour.